Brand identity expert David Brier shares how Les Grossman (played by Tom Cruise) showed us how a highly unrefined, foul-mouthed Hollywood heavyweight producer can steal the show at the 2010 MTV Movie Awards … while leaving behind some branding lessons to live by. Les Grossman is that highly unrefined, foul-mouthed Hollywood heavyweight producer who first came to notoriety in Tropic Thunder. Brilliantly portrayed by Tom Cruise, Les is definitely more. His most recent escapade appearing in various video shorts and a live performance (with Jennifer Lopez) at the 2010 MTV Movie Awards brought with it some lessons. Maybe they should be called Les’ns. But whatever, the man, the myth, the legend, the forehead are all bigger than life and here are some takeaways about what we can learn from LG. 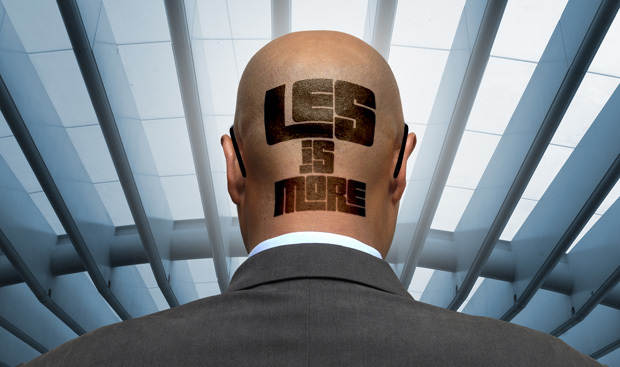 There is no confusing Les with any other film character. And, like it or not, branding is, in part, theater. Face it. You’re setting the stage to tell your story, to present your products which are the characters of your production. Are you going to have a cast of forgettable characters or a production of memorable ones that engage your audience? Distinction goes a long way for a brand. If your brand can easily be confused (or mistaken) for your competitor, then you unfortunately are not memorable and stand for very little. Les’n learned: Be unmistakable. And once you’ve done that, revisit it to make sure you’ve gotten there for real. Heck, at least when Dave Thomas was doing the Wendy’s commercials, I remembered the Wendy’s brand. Didn’t you? Did you see Les in any of his promo videos or on stage shakin’ his booty? He held nothing back. He came out and the audience was standing, dancing, cheering, blown away by his total immersion into that character. The kind of immersion that the best brands do every day. Look at Dyson vacuum cleaners. They stood–boldly with total conviction–for great design and single-minded focus on “no loss of suction.” The result was all the incumbents–Electrolux, Kenmore, Hoover–who were busy being complacent started frantically scrambling to catch up. Why? Because they stopped creating something amazingly fresh, new and relevant. They stopped going all out. Les’n learned: Customers will ignore you if your brand is holding back, half-committed to excellence, and only making moves that are more political than strategic. Be bold. Be remarkable. Be outstanding. When Les hit the stage, he didn’t just show up, he took a flying leap… literally. He made an entrance that was impossible to ignore. What type of entrance is your brand making on the stage you’ve set for your brand? Before the “water wars” started years before Pepsi and Coca-Cola entered in, there was Smart Water, which built its empire on solid package design, smart branding and an impossible-to-ignore bottle. Pardon the pun, but they didn’t allow their brand to get watered down with improper corner-cutting. Les’n learned: Dream big. Pay attention to the details. Never lose sight of that mountain (because after that mountain, you’ll discover another one to climb). Do something beyond the expected, please. Consumers are exposed to over 26,000 new products per year. That averages to over 70 per day, seven days a week. Fact is, we are in the age of information overload. How did Les do it? Les broke every expectation, dancing with J Lo, doing some Fly dancing. Prior to that, he had Will Smith’s son, Jaeda, break his arm in a short video. Prior to that, Les interrupted the famous Tom Cruise underwear dance scene. In short, nothing was sacred. Les’n learned: Jettison any complacency and any notion that your brand can merely do things “the same way we’ve always done them” since someone will come along and make you yesterday’s breakfast, like Apple did to the smartphone industry with iPhone. Here’s to successful branding (and doing more with Les). brand makeovers. You can follow him on Twitter here.